If you’ve seen a Pennzoil commercial or had an oil change anytime in the last few decades, then you’ve probably heard of synthetic oil. Perhaps you’ve even bought it or had a mechanic convince you to try it out in your vehicle when you had your oil changed. But do you actually know what it is? When that mechanic started talking about oil groups and viscosity, did it all make sense or did your eyes glaze over as your brain desperately tried to figure out a way out of the conversation? I’ll be honest – discussing oil viscosity is not exactly the sexiest thing around – at least not when it comes to motor oil. But it’s important to know what’s going in your vehicle and understand if you should choose conventional or synthetic oil for your engine. Don’t worry, it’s not as bad as it might seem at first, and the more you know the better equipped you’ll be for your next oil change. So, let’s take a look at what synthetic oil is, how it compares to conventional oil, and what it all means to you. Synthetic motor oil is, quite simply, any motor oil that is not just extracted from the ground and refined, but is also further purified and manipulated on a molecular level. So, most motor oil starts its life as mineral oil extracted from the ground, which is then refined to more effectively coat the moving parts of your engine. The oil in your car improves the efficiency of your engine by reducing friction as parts move against each other, which keeps heat down and lowers wear and tear through everyday use. There are five groups when it comes to the quality of motor oil. Group I and II are conventional motor oils that are basically just mineral oil that has been refined to differing degrees. Group III is also made using petroleum oil, like Groups I and II, but it is further refined and purified to become synthetic oil. Groups IV and V are not derived from petroleum, they are completely synthetic and have no basis as a petroleum oil to begin with. So when someone says “synthetic oil” they are referring to Group III, IV, or V motor oils. What’s the point of all that, you might ask? Well, synthetic oil has a number of advantages over conventional oil. In fact, there is really only one way that conventional oil could be considered superior, but we’ll get to that in a moment. Sounds pretty good, right? So why would anyone use conventional oil over synthetic? Well, depending on brand, synthetic oil can be well over twice the cost of conventional oils. Sometimes as much as four or even ten times the price. That’s the one advantage that conventional oil has: it is, quite simply, much cheaper when you buy it. It is worth mentioning, however, that synthetic oil is arguably cheaper or the same price in the long run. Improved fuel economy and fewer oil changes needed, plus keeping the engine running smoothly, can all save you money. But when it comes to immediate out-of-pocket costs, convention oil is less expensive. Just in case all of this talk of oil groups and molecular manipulation wasn’t complicated enough, there’s another aspect of synthetic oil you should be aware of. That’s the difference between “full synthetic” and “synthetic blend” oils. You’ll see these terms used sometimes and their meanings are not as straightforward as they really should be. In theory, full synthetic oil is one that is purely synthetic, not based on petroleum at all. These would be Group IV and Group V oils that are not mineral-based, but instead are designed as purely synthetic oils. Unfortunately, there is no legal standard in the US for what can be called “full synthetic,” which means that a lot of oil manufacturers use the term as marketing and not in reference to the Group of the oil. Therefore, you’ll see a lot of Group III oil marketed as full synthetic, so keep this in mind as you compare costs of different oils. Then there is oil called a “synthetic blend,” which is synthetic oil that has been mixed with conventional oil. 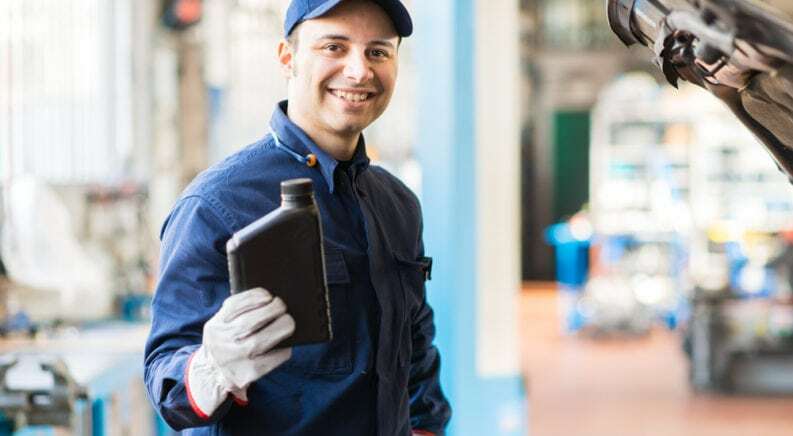 A synthetic blend gives you a lot of the advantages of synthetic oil, but since it is mixed with conventional oil, these advantages are somewhat reduced. However, you also pay a lot less for this kind of synthetic oil, so it can be easier to choose this over a full synthetic that can be much more expensive. I’d like to say this is a difficult question to answer, or that it all comes down to personal preference or style of driving. In reality, however, there is a very clear answer to this question. Full synthetic oil is the best overall – it provides the best protection for a vehicle’s engine, reduces emissions the most, and lasts the longest. Conventional oil is fine, but it doesn’t work nearly as well as full synthetic does, requires more frequent changing, and produces more emissions. Synthetic blend oils, then, fall right in between these two. They offer better performance, emissions, and longevity than conventional oil but not as good as full synthetic. So, what’s the point? Why should you care? Well, next time you go to get your oil changed, strongly consider synthetic oil for your vehicle. Now that you know the advantages it offers, there’s no real good reason to not choose synthetic oil for your vehicle. If a true full synthetic option is just too expensive for you, then a synthetic blend is a great choice that gives you better functionality while going a bit easier on your pocketbook. Or, there’s one other option you might consider: switching back and forth. That’s one more great advantage of synthetic oil – there’s absolutely no downside or drawback from switching from one type of oil to the other. So if using pure synthetic, or even a blend, is out of your price range every time you get your oil changed, consider using synthetic oil the next time you get your oil changed, then going back to conventional after that, and alternating back and forth between them with each oil change. By alternating back and forth, you get a lot of the advantages of synthetic oil and your oil changes won’t be quite as expensive overall. Plus, running synthetic through your engine for a while can actually help clean out anything left behind by conventional oil. It’s the best of both worlds.